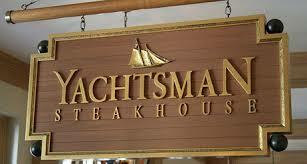 The Yachtsman Steak House is situated in Disney’s Yacht Club Hotel and part of the Yacht & Beach Club Resort. Hotel security at the hotel entrance gate house will ask for ID, and parking is simple with a choice of Valet or Self-parking, (self-parking complimentary if you have a reservation). The restaurant is an upscale (but family-friendly) steakhouse, featuring high-quality, grain-fed beef, aged in-house and prepared on an oak-fired grill in the open kitchen, fresh seafood and more, are options here, but make no mistake from the time you enter the restaurant you will be in no doubt that steak is the “Hero” here! As you enter the restaurant, there is a temperature controlled display room where various meats are being hung and going through the aging process, if you time it correctly, you may be able to watch the chefs select the meat and hand cut steaks in this dry-aging room. The theming of the restaurant is inclined towards New England in design and featuring nautical elements with light woods, neutral colors and port holes etc. Unlike a lot of Disney restaurants this design and theming is not over the top, the main circular dining room prefers to draw from the fantastic views of the Yacht Club Resort “Stormalong Bay’ pool area, via the large windows and open views. Pick the right table later in the evening and you can even see the Epcot fireworks from the comfort of your dining table. I have been a patron of the Yacht Club Steakhouse for over fifteen years and had many celebrations, birthdays and special occasions here. I have introduced family and friends to their delightful food and at some point I have sampled most of the menu, from steaks through sea food to desserts. So without laboring through eloquent descriptions of every dish, I am happy to recommend any menu selection of your liking, as I have never had a meal here that was anything less than outstanding. Of course all meal selections are subjective, but from my own personal view the steaks here are among the best I have ever tasted anywhere in the world and the cast at the Yachtsman’s Steak House have been providing this standard of food, with quality and consistency for many years. The menu is very focused and neither over wordy or over long, it reflects seasonal changes but some stalwarts and favorites have been on the menu for some time, thereby avoiding disappointment for regular guests but adding intriguing new menu items to remove any possibility of menu fatigue. As you would expect from Disney the accent here is on fresh ingredients, locally sourced wherever possible, and only the finest in quality and provenance. The Bread Service – A simple menu addition but easy to overlook, you must try the soft pull apart rolls with crunchy onion strings on top served with a delicious pot of perfectly soft roasted garlic cloves. Kids are not left out with their own menu section that will really hit the mark. Desserts again are hand crafted delights, I nearly always finish off with the Crème Brûlée, a delicious concoction of Vanilla Custard and Mixed Berries with a crunchy torched sugar topping. No room for dessert, then I would finish off your meal with a Keoke Coffee – Kahlúa, Brandy and Dark Crème de Cacao, or for the Whiskey lover you must try the Scotch Flight -a 1/2-oz pour of each: Macallan 12 years old, Lagavulin 16 years old, and Macallan 18 years old. In terms of wine, your cast member server will be delighted to suggest “Wine Parings” that compliment your meal. Disney describes the Yachtsman Steak House as “Signature” which they say defines casual elegance and outstanding service. A bold statement, but in this case well deserved, the extraordinary service delivered by the cast members, accompanied by exceptional product knowledge and attention to guest total satisfaction justifies the comment and then some. Table 23 in the bay window provides the best views of both ‘Stormalong Bay” and Epcot fireworks. Reservations are a must at peak times, you may be lucky and score a table as a “Walk in” but why risk that special occasion on luck. Arrive early for your reservation and sample a great cocktail or two in the Crews Cup Lounge right next door to the restaurant. As a “Signature “or “High End” dining occasion the Yachtsman’s Steak House, depending on your menu choices, can be on the expensive side, but for this quality of food, service and with some severe guest pampering I hope you will feel it was worth every dollar and make it your favorite too.